The Iwama Aiki Shuren Dojo is an Aikido Dojo dedicated to the correct transmission of Dentō Iwama Ryu Aikido. We follow the teaching of Saito Hitohira Sensei. The club has been established at the Tokei Martial Arts Centre, in Central London, for 20 years. We have a solid foundation of senior students happy to support the development of new students. All the senior students of the dojo have trained at Saito Hitohira Sensei’s dojo in Iwama, Japan. 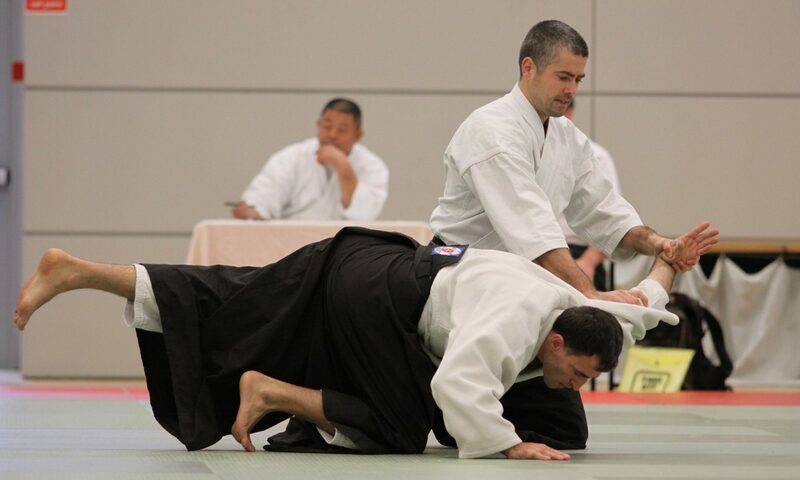 Training is suitable for anyone who is looking to study Aikido as a Budo. All new students and aikidoists looking to study and develop in the riai of Aiki-ken, Aiki-jo and Katai-keiko of Dento Iwama Ryu are welcome at the Iwama Shuren Dojo, London. It must be emphasised that there are no shortcuts to proficiency in Aikido. Consequently, attaining proficiency in Aikido is a matter of sustained and dedicated training. No one becomes an expert in just a few months or even a few years. At the Iwama Aiki Shuren Dojo London we study the body organisation which underpins correct movement and power generation in Aikido. Our “internal strength” study includes the Aunkai body method of Akuzawa Minoru Sensei, and the CanDo-Bar reeling method created and developed by Mike Sigman. We focus on these approaches during our Wednesday morning and Thursday classes, and incorporate our deepening understanding of kokyu-rokyu (breath power & Jin) and Ki (Qi) into our Aikido practice on Mondays and Saturdays. The two ways new students enter training is either by joining our general practice or by joining via an induction class and two months for the price of one offer. Neither is preferable, it is dependent on the student’s comfort and experience. Monthly standard mat fee £60 able to attend all 4 weekly classes (£40 for F/T Students). Monthly single class per week fee £40. Induction offer £60. Includes access to all classes for two months. For individuals looking to experience our club and training to discover if Iwama Aikido is the right art we have an introductory 4 Class Fee of £25. This allows the new student get a good amount of exposure to our training before committing to ongoing training. The Iwama Aiki Shuren Dojo London trains in two locations.